Yes it’s a pumpkin recipe…but it’s great year-round. Try these baked oatmeal bars for an easy grab-and-go breakfast this week! Hi friends. This is one of those recipes that I have memorized because I make it so frequently! It’s plain and basic in the best way. You know those non-fussy recipes you just always go back to? This is one of those. It’s easy to make, and my toddler loves them. That’s all I need for a recipe to be a keeper! I’ve adapted this recipe over the years to land on our favorite version. I only use 1/4 cup of brown sugar, but feel free to bump that up to 1/2 cup if you’re serving this to guests or prefer a sweeter bar. We eat these so frequently in our house! They are easy to grab for breakfast or a snack. Sometimes I even put one in my son’s lunchbox to mix things up. Even though there’s pumpkin in this recipe, it really is good year-round. You don’t have to limit yourself to the Fall pumpkin season! It’s not overly pumpkin tasting. I like the pumpkin here though because it keeps the bars tender, and adds vitamins. My son is not a fan of squash or sweet potatoes, so this is a good way for me to get him some beta-carotene (vitamin A). And they are nut-free, gluten-free (if you use GF oats), and can be dairy-free if you use non-dairy milk, and coconut oil in place of butter. The texture of these bars is kind of similar to a muffin. They are doughy, and hold together well. Some baked oatmeal recipes are kinda gooey and you need to use a spoon. These bars are not like that. They are more bread-like. I love them as a lower-sugar alternative to a muffin or a sweet bread! Store the bars in the fridge for 4-5 days, or store them in the freezer to keep them longer. We usually eat them within a couple days, though! 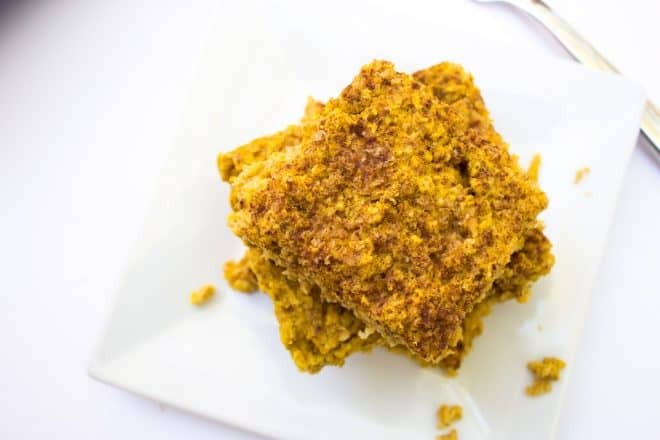 A nut-free, gluten-free, pumpkin-packed breakfast or snack, these baked oatmeal bars are a staple in our house. Dairy-free if you use non-dairy milk and substitute oil for the butter. Kid and toddler approved! Preheat oven to 350 F. Grease 9x13 baking dish or line with parchment paper. In a large bowl add dry ingredients, then wet. Mix well. Spread into baking dish. The mixture will be fairly thick and you will need to spread it out evenly in the dish with a spatula. Sprinkle a bit of additional cinnamon and brown sugar on top. I use maybe about a tbsp of brown sugar, and a few shakes of cinnamon. This helps add a sweet taste since the recipe does not use much sugar. Bake, uncovered, for 20-25 minutes. Let cool before cutting into squares. I typically use canned coconut milk in this recipe, but I've also tried it with 2% milk and almond milk, and it's still very good. Use whatever milk you feel like! I made these a few days ago and we really like them! Easy to grab to eat during an early morning baby feeding before I get a chance to fix breakfast.. I wake up starving in the morning! Yay I’m so glad you like them! Haha yes I know exactly what you mean…sometimes I wake up really angry but realize I’m just super hungry haha it’s the breastfeeding hunger!